Sydney is the largest and oldest city in Australia. It's a very cosmopolitan city and for many visitors it is likely to be their point of entry and exit to the country. Sydney is a very beautiful city with a lot to offer travelers. It's rich in history, nature, culture, and art. It's also got miles of coastline and impressive sandy beaches. The city is also a haven for backpackers who are just beginning there trip to Australia. 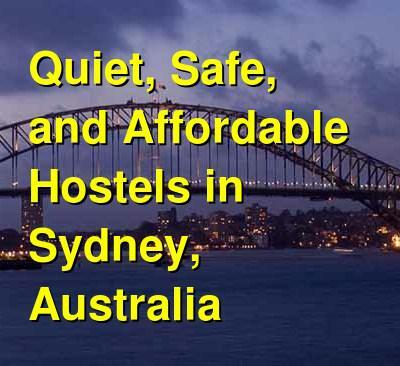 There is no shortage of hostels in Sydney. Many offer a variety of social activities and some are more party oriented than others. If you're looking for a more laid back setting at an affordable price, then the hostels below are great options. A good option for solo travellers, couples, groups, and families. Woolbrokers at Darling Harbour is more of a hotel than a hostel. It's located in the heart of Darling Harbour and provides easy access to almost anything you would want to see and do around the city. The hotel has rooms that are clean and comfortable. There are shared bathrooms, which help keep the prices reasonable despite the prime location. The hotel is also walking distance to Paddy's Markets, the IMAX, the Convention Centre, Cockle Bay Wharf and King Street Wharf as well as many other attractions. In total there are 27 rooms that include singles, twins, doubles, and three, four, or six bed family rooms. This hotel is a great option for all types of travelers including those traveling alone, as a couple, or in groups. This is also a good option for families. This hotel is recommended in many different guidebooks, so reservations in advance are a must. It's a great place to stay with friendly service and a welcoming staff. You're sure to enjoy your time at Woolbrokers. A great hostel for backpackers, solo travellers, and female travellers. Railway Square YHA is an award winning hostel in Sydney. It's located right next to Central Station and it has a laid back atmosphere where it's easy to meet other travelers but you can still enjoy a little peace and quiet. It's also a unique place to stay because it's the only hostel in Australia that's actually located in a railway station. You can even stay on a parked train. There are fun red train carriages that offer an interesting place to stay. There are also traditional rooms that are in the historical main building. The hostel also has a lounge, cafe, pool, and deck area. There's a travel information desk and free wi-fi in parts of the building. The hostel is located in the middle of Sydney's backpacker district. You can walk to many of the major attractions around town and there is great shopping and nightlife centers in the area. Chinatown and Paddy's Markets are also close by. The hostel has dorms that sleep four or eight people. There are male only, female only, and mixed rooms to choose from. Mad Monkey Backpackers on Broadway is another affordable and comfortable place to stay in Sydney. It's just a short walk from Central Station and it has a modern decor, air conditioned rooms, and updated bathrooms. The hostel also offers free wi-fi, a free continental breakfast, and a variety of organized events. This is a fun hostel to stay at where it's easy to meet other travelers, but it also offers a good retreat if you want to enjoy a full nights sleep. The staff are friendly and helpful and they are respectful of all of the guests. The hostel is conveniently located near many parks, restaurants, tourist attractions, and great nightlife areas. The Broadway shopping centre is also just a short walk away. This is a safe and comfortable place to stay. Guests are given large security lockers for their belongings but you must bring your own lock. There are both private rooms and dorms available. Private rooms include twins and doubles with shared bathrooms. Dorms sleep four, six, or eight people. Both female only and mixed rooms are available.